Mouth-watering Persian recipes from Sabrina Ghayour. Following the book reviews for Persiana, we conclude that it is one of the best (primarily because we are fan of no-frills cooking). Here is our recommendation: try and follow any one of her simple recipes, put out the candles for dinner and bring out the smiles in your significant other. Remember: everyday is Valentine's day!!! The walls of Sabrina Ghayour's Earl's Court flat are lined with family photographs and Persian poetry. Ghayour and her mother have lived here for 36 years and it's where she began hosting supper clubs two years ago. "I was worried my diners would think the poems were terrorist scriptures," she says. "I fretted too much about what people would think of me back then." 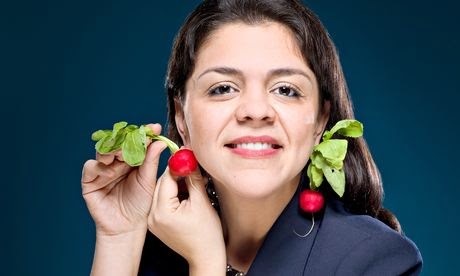 When we meet, Ghayour, 38, is preparing a family feast to celebrate the Persian New Year, an occasion that coincides with her publisher sending over the first copy of her debut cookbook Persiana. Filled with 100 recipes she's refined over the years, it also draws on a childhood spent in the kitchen: "I was precocious," she says. "My mum and grandmother couldn't cook for toffee – so at 11 years old, I became the cook." There's a photo in Persiana of Ghayour, aged six, stirring a pot with a wooden spoon as long as her arm: "That was the first time I ever cooked – boil-in-the-bag cod mornay." Born in Tehran, Ghayour moved to London in 1979 at the beginning of the Iranian revolution. "We were lucky," she says. "My mother had been studying in the UK and had this flat." Her parents separated around the same time, her father moving to Los Angeles with his new wife, while Ghayour, her mother and grandmother settled in west London. "My mum had me when she was 20, so we've always been more like sisters, and I was very close to my grandmother – we shared a room." After school she spent 15 years working in events and marketing for restaurateurs, including Ken Hom, as well as corporate catering in the City of London. Made redundant in 2011, around the time of Thomas Keller's £250-a-head pop-up version of The French Laundry in Harrods, Ghayour half-joked on Twitter about doing her own, The French Launderette, for £2.50. Within hours – still via Twitter – she had more than 30 bookings. "I was offered the use of a restaurant on a Sunday, when it was closed, and ingredients – meat, fish, wine. Jason Atherton's Pollen Street Social team offered to do my front of house." In the end Ghayour served 80 people, raising £4,000 for Action Against Hunger. Since then she's been hosting up to three supper clubs a week, as well as taking private cheffing jobs and teaching Persian cookery: "It's exhausting, but I am constantly aware of how lucky I am. I was never a chef, just the dorky events girl that loved food." Never heard of her - wow. What the hell is this? some woman is cooking in her house, and it is news?